Welcome to the new generation of modified containers. With the Muvbox Base Unit © we set out to create a model that would allow us to scale our production, improve our build quality and lower our prices and lead-times, without compromising on design. Strong of years of experience in container modification we have developed a system which allows for multiple configurations out a single unique Base Unit ©. Or $729/month* based on a 60 month term. Scroll left and right for features. Each Base Unit comes equipped with 3 LED panels that emit a well balanced, crisp white light throughout the space. 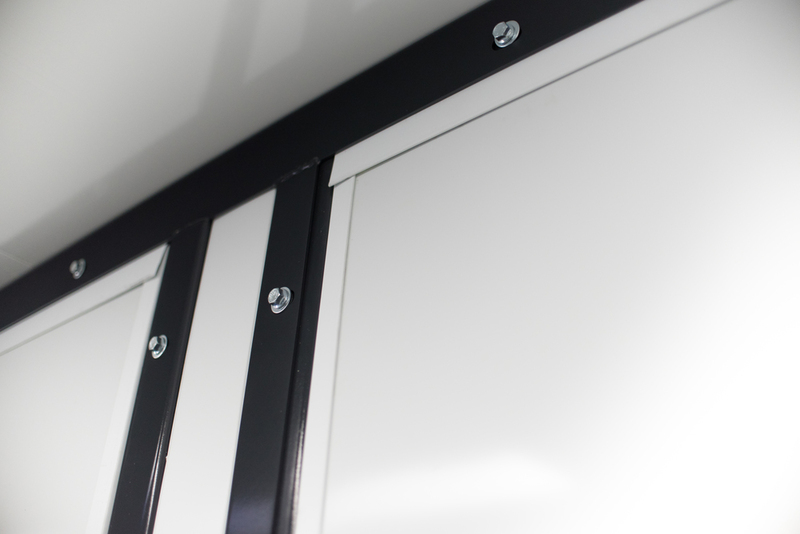 Our modular panels can be removed and installed with ease thanks to our simple bolt-on system. Gaskets have been integrated to our metal frame for a water-tight installation. 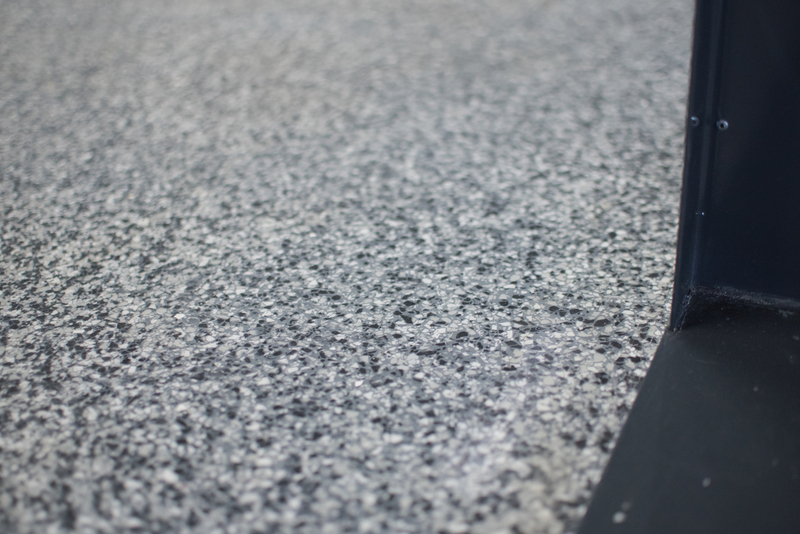 Epoxy creates a seamless, easy to clean surface that is hard wearing and chemically resistant, while providing an attractive high gloss finish. The Base Unit comes equipped with 8 outlets, a 200A breaker panel, and Teck armored cable. Each unit is inspected and approved for CSA. Choose from the following options to customize your unit. Comes equipped with a flip-up panel, latch & lock, stainless steel counter and an optional sliding window. Comes equipped with a side light, a continuous hinge, an automatic door closer and stainless steel door pulls. Comes equipped with a small window, a continuous hinge, mortise lock and chain door stop. The walls have a 4 inch spray foam core which gives an insulation factor of R28. They have a smooth painted steel finish. The side opening is activated by two hydraulic arms. Once open the side panel becomes a flat surface. Up to two Full Side Openings can be installed per Muvbox Base Unit ©. * Requires a Power Unit Room. This room houses the Hydraulic Power Unit and breaker panel on units that have a Full Side Opening. It is accessible by the original container doors located at the back. Our connection module makes it possible to merge Muvbox Base Units © on any side. Connect & scale. A sample of typical units and pricing. *Prices are in Canadian dollars and subject to change according to current rates of exchange. Muvbox is set to deliver 26 units for Hawkers Wharf, a harbour front open air food market, dining destination and accelerator coworking kitchen located in Vancouver B.C.